“The third place.” Attributed to Ray Oldenburg, the phrase refers to an inclusive, comfortable space that isn’t home (“the first place”) or the office (“the second place”). Informal in nature, the third place encourages individuals to interact, exchange ideas, and have a good time. Coffee shops, neighborhood pubs, fitness centers, and houses of worship are all examples. So, too, are libraries – especially the new Brightwood Branch of the Indianapolis Public Library. The new, 15,000-square-foot Brightwood Branch will replace the current branch, which is located in a shopping center across the street. The Brightwood Branch has served the community for more than a century. Its original location (2435 N. Station St.) opened in 1901, making it the sixth public library in Indianapolis. Over the next seven decades, operations moved up, down, and around Station Street. Then, in 1972, the library relocated to a shopping center on Sherman and 25th streets – its current location. While the Brightwood Branch does have a handful of study rooms and a large meeting room, it is undersized. That’s why, several years ago, the Indianapolis Public Library started looking at ways to expand the branch. Finally, in late 2017 – after more than a year of negotiations with property owners – the Board of Trustees approved purchase agreements for a 2.3-acre site. The process of designing new, 15,000-square-foot library began. When Axis was selected for the project, our firm had already worked on a handful of projects for the Indianapolis Public Library, including the Garfield Park and East 38th Street branches. We knew from experience that libraries weren’t just about collections; they were about the community. They provided patrons with a welcoming atmosphere and a wealth of resources. And they weren’t just places to read or research – they gave the community a spot to hang out, hold meetings, toss around ideas, learn a new skill, or find a job. Research tells us that libraries aren’t the solemn institutions they used to be. Instead, they have embraced their role as community gathering spaces. But in order to design a successful third place, we had to engage the community. After all, successful buildings are never designed in a vacuum. So, what was important to the Martindale-Brightwood neighborhood? Places for group meetings, as well as open social space and quiet reading zones. Teen zone? Check. Children’s area? Done. There is also an expanded computer lab and a makerspace with a 3-D printer. A “tech lab” also will allow patrons to check out laptops and other technological items and give them a try. Another important feature? The library’s civic presence. 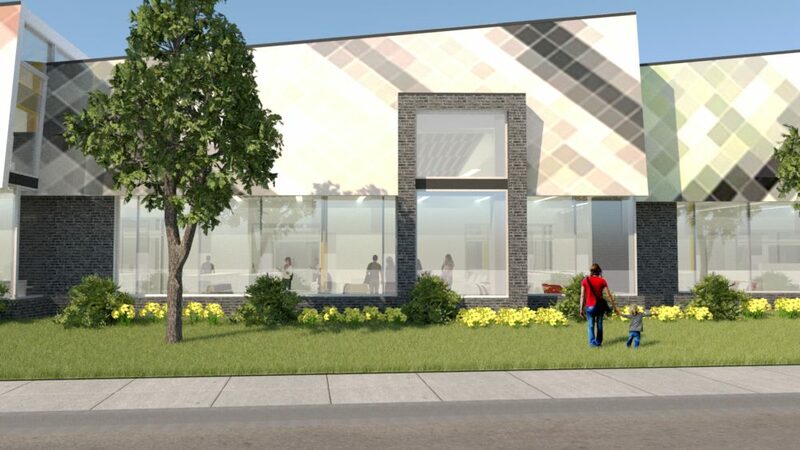 The new Brightwood Branch will be completed in October 2019 and will include designated areas for children and teens. It will also include a “tech lab,” which will allow patrons to try out new technological products. When designing third places, transparency and inclusivity are key. Take a look at civic projects like the Julia M. Carson Transit Center, Tarkington Park, or the White River State Park Visitors Center. Each project is an architectural icon in its respective context. Similarly – due to their civic stature – libraries must provide a sense of place. At the new Brightwood Branch – set to open in late 2019 – glass walls provide sweeping interior views. To further embrace that sense of openness and transparency, Axis designed the interior to reflect Martindale-Brightwood itself. “The overall themes were African-American heritage and the history of the community,” said Kathleen. “A tapestry of texture, materials, and layering of neutral colors provide a timeless backdrop and add a soothing energy.” Light-filled areas with visible activity hubs also help patrons feel less intimidated and more at-home. The casual atmosphere encourages patrons to enjoy the space and crack open a book or boot up a laptop. It’s about being comfortable. About learning. About exploring. “Flexibility” isn’t a buzz word. It’s a design element essential to a library’s long-term success. At the new Brightwood Branch, we incorporated a variety of large, open spaces that are bathed in natural light. That way, as technology evolves and the library’s needs change, the space can be manipulated. Perhaps, someday, it will need more computers. Or more collaborative working space. Maybe it will be transformed into a quiet reading area. Or, on the opposite end of the spectrum, a place to watch DVDs. 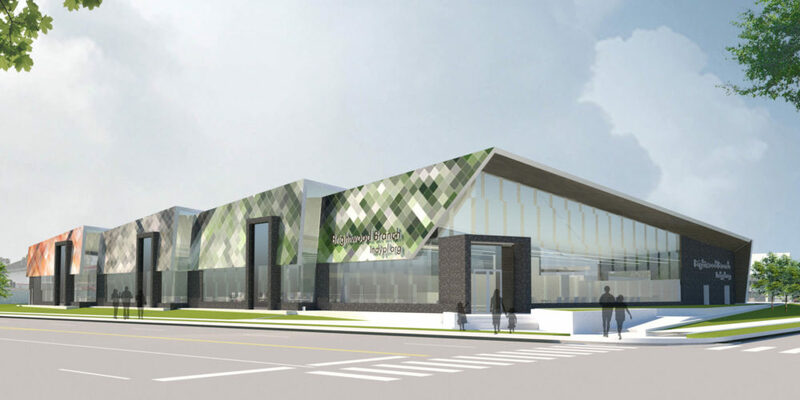 The new Brightwood Branch is part of the Indianapolis Public Library strategic plan, which continues through 2022. The $5.9 million project will be completed in 2019 and will serve as a civic anchor and “third place” for the Martindale-Brightwood neighborhood.